“And I said to myself, What? The Pope?,” Agustín recalls. Instead of a papal blessing, here was some man-to-man advice—the Pope, of all people, telling him not to worry if there was some everyday strife in his marriage. Unexpected, and yet utterly in character for the man we have come to know simply as Francis—the frank and unaffected Jesuit who has become one of the most famous and most beloved people on the planet. Now he is just the Pope, and he is so at ease in his white cloak that it seems he was meant to be Pope all along. Now he has gotten many of us wondering what might have been if he—who was said to be second in the balloting—had been elected after John Paul II’s death, in 2005, instead of Joseph Ratzinger, who became Benedict. Now, making sense of Francis isn’t a matter of figuring out what he thinks or whether he is for real. It’s a matter of seeing him for what he is. 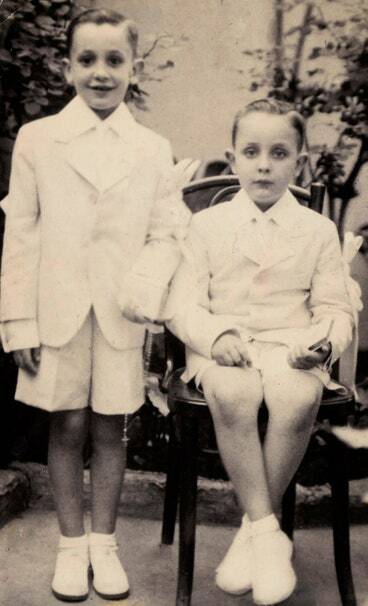 A young Pope-to-be (standing) with brother Oscar Bergoglio at their First Communion, in Argentina, in the 1940s. And what is he? He is a free man, that’s what he is. Somehow he has stayed true to himself and to the core Catholic message and has kept free of the pomp of the papacy, the crush of celebrity, and the expectations of the global Church. “He doesn’t ‘play’ the Pope,” says Archbishop Claudio Maria Celli, head of the Pontifical Council for Social Communications. 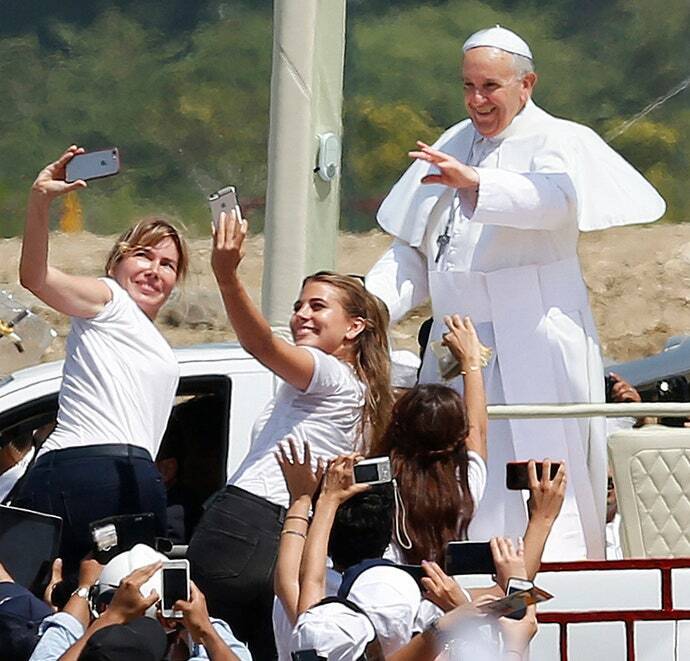 “He is who he is.” He’ll ride in the Popemobile with the protective glass down, no matter the security risk. He’ll establish a shelter for homeless people near St. Peter’s Square. He won’t stop speaking off the cuff and he won’t insist that all the cardinals agree about everything. With 1.2 billion members, the Church is a tumultuous household, and he isn’t going to worry about a few flying dishes. This month, Francis comes to North America. He will make an overnight stop in Cuba before a six-day trip to Washington (where he will meet with President Obama and address a joint session of Congress), New York (where he will address the United Nations and visit Ground Zero), and Philadelphia (where a papal Mass is expected to draw a million or more faithful). The visit will be his first to this country in his life, and it will take place as he faces unruly opposition from staunchly conservative cardinals and their powerful local backers on a range of Church-wide initiatives: overhaul of the long-corrupt Vatican Bank; a synod of bishops on the Church’s approach to family matters (among them, sexual matters); and calls for concerted action on climate change and “sustainable” economics. Francis gets six or seven significant interview requests a day, the head of the Holy See Press Office says wearily—or more than 2,000 a year. But he rarely grants interviews, and then on impulse (to some Belgian Catholic students here, to the in-flight traveling press corps there). In fact, a request for a formal Vanity Fair portrait session elicits a message of spontaneous regret conveyed by a close associate: “His answer was that ‘due to his neurosis’ (and here he laughed) he is ‘allergic’ to these kinds of things” and so must decline. “He’s one for action shots, not portraits,” his confidant Antonio Spadaro, an Italian Jesuit priest, tells me, showing me the home screen on his iPhone: Francis drinking his favorite tea (maté, from Argentina) through a silver straw. In Rome not long ago, I saw Francis from a half-dozen different vantage points—saw him from as close up as you can get. I also met with some of the people who know him best and work with him most directly—to get a sense of the man in full and to learn how he stays free. On Sundays, pilgrims gather in the vast ovoid piazza in front of St. Peter’s Basilica, and at noon the Pope appears in an open window of the Apostolic Palace and leads them in an ancient rite of prayer called the Angelus. So it has gone for hundreds of Sundays since Pope John XXIII first led the prayer from the window, in the early 60s. But with Francis the weekly Angelus—like so many other things—is different. Francis is the first Pope in 110 years who hasn’t lived in the palace, and he has shaken off many monarchical trappings. Up in that window, he isn’t a ruler condescending to look down on his subjects. The window isn’t a portal to the divine; it’s just an ornate window in a city full of them. This Sunday, after several days of rain, the sun is out, and close to 100,000 people are in the piazza—more than twice as many as typically came under Benedict XVI. Some Romans roll mountain bikes over the rough stones. Tour groups cluster beneath their pennants. Street vendors push this year’s souvenir: the selfie stick. Francis comes to the window and waves, and we see him. Sure, we’re seeing the Pope, on high, an icon in extremest white. But in the mind’s eye we also see the ordinary pastor who embraced a man with boils in St. Peter’s Square; who put on a clown nose without worrying that it might diminish the dignity of the papal office. In spirit, Francis isn’t up there in the palace. He is down in the square with everybody else. In July, Francis arrived for Mass in Ecuador. His decision not to live in the palace is still the most telling thing he has done. He said the decision was simple: “Inside myself I distinctly heard a ‘no.’ ” But the symbolism was and is powerful. He is the Pope, but he’s living at street level, in a residence akin to an Extended Stay Vaticano. He’s living the way he was living the week the other cardinals elected him. That week, he had Room 207 in the Vatican guesthouse, called the Casa Santa Marta, where all of the cardinal-electors were sequestered during the conclave—and kept from distractions, worldly communications, and press leaks. Cardinal Walter Kasper, a prominent German theologian, had a room across the hall. Kasper, who ran a crucial Vatican office under both John Paul II and Benedict, was the rare cardinal who dared to speak out frankly against the harshness of their approach. He is 82 now, but the features that earned him the nickname Kasper the Friendly Cardinal are still there: eyes bright behind rimless glasses, and a ready smile.